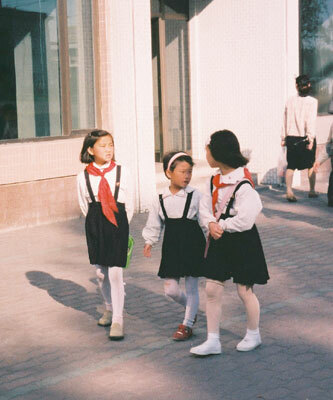 North Korea (DPRK) - Pyongyang: Streets, Shops, traditions, life. Part I. As I promised, I will now tell you a bit about every-day city life. I should note that we have seen much more than what is in the pictures. I will describe the things which I didn't take pictures of, because in many cases it seemed to me that taking the camera out would be simply inappropriate, even though it wasn't forbidden. 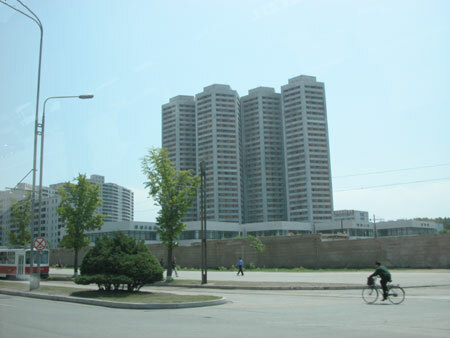 The Pyongyang architecture is quite diverse for a modern city (i.e. 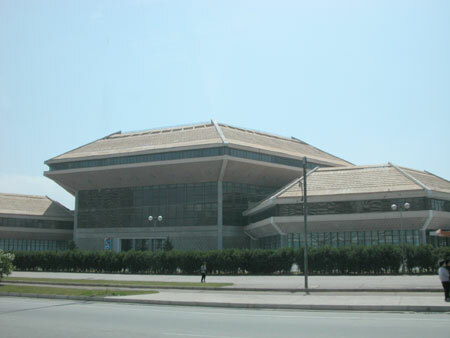 one completely rebuilt after the war). 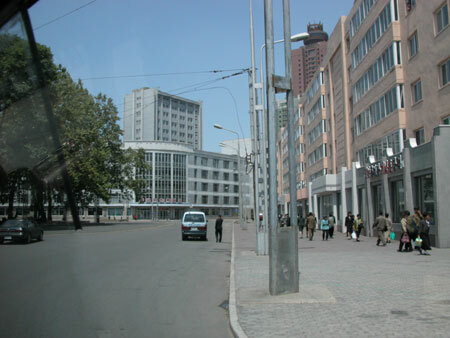 Some buildings here are very modern, some are constructivist build in the 1920's - 1930's (I don't even know if they survived the war or were rebuilt after the 1950's), and some are reminiscent of our "Stalin Empire." 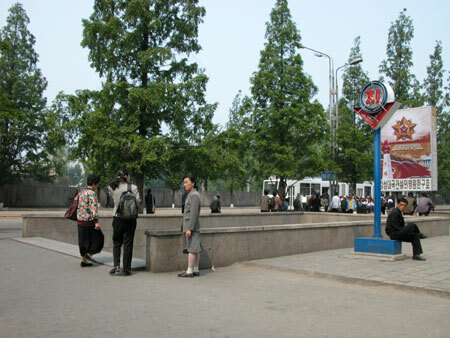 For example, the railroad station on the far right in the picture. … here it is closer. 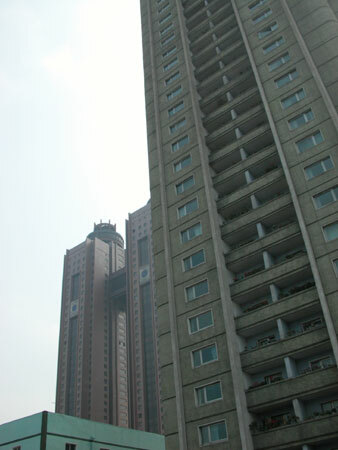 It is hard to say which architecture style is prevalent. The general feeling is that older quarters are gradually disappearing among the modern ones. 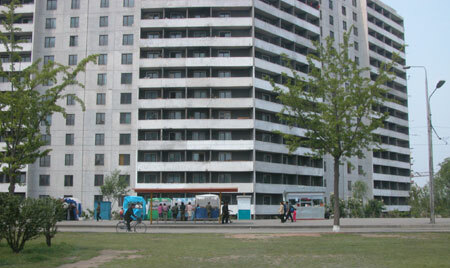 Of course there are a lot of simple residential buildings, mostly apartment blocks. 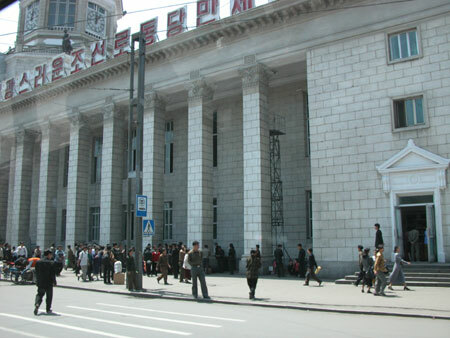 The population of Pyongyang exceeds 2 million people. 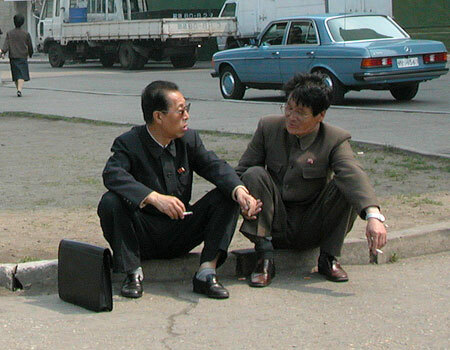 The people on the street are dressed quite modest, but neat. 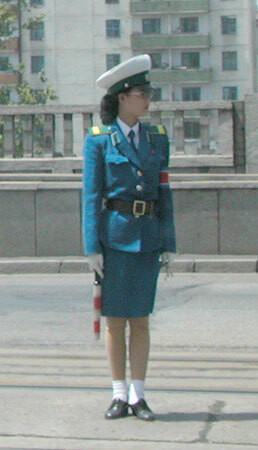 Officials of a more or less high status wear clothing reminiscent of military uniform. 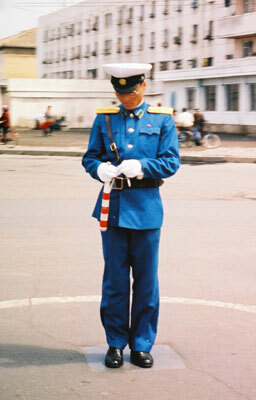 Though, often it is military uniform. 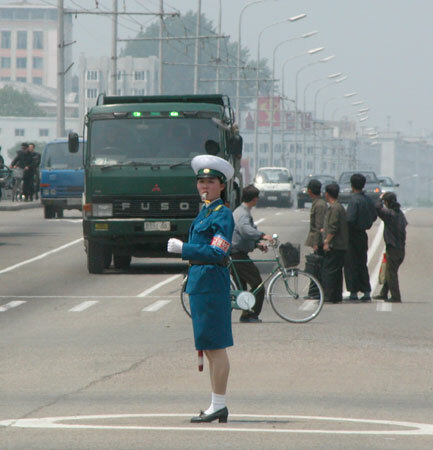 Despite the fact that many intersections have lights and that there are very few cars (I don't think traffic jams ever occur) - the lights are off, and police girls are directing traffic. 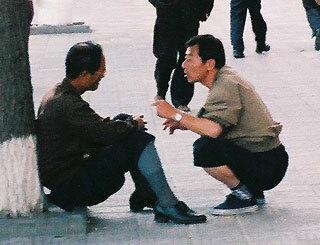 Rarely men act as the crossing guards. example) - are mostly men. Once I watched them stop a bicycle rider. I haven't seen any police cars. 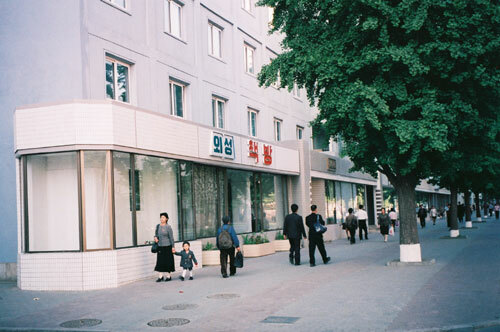 As I understand the law enforcement system of North Korea and from what I have seen - the crime level is probably rather low. Though, there are bars on some first floor windows. 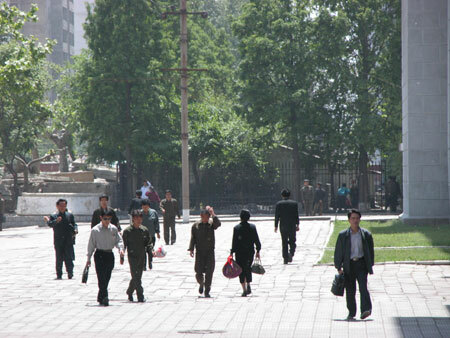 But mostly outside of Pyongyang. There are many underground crossings (compared to Piter, where despite heavy traffic we have less than 20 of them). 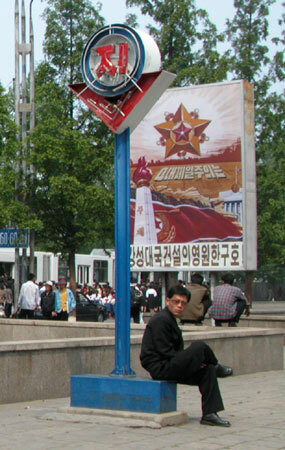 During our stay we have seen in the centre of Pyongyang one or two billboards featuring a car - seemingly a joint venture with DAEWOO. Every once in a while one can see such tormented cars on the street. Usually, judging by licence plates and the drivers, they are from outside the capital. 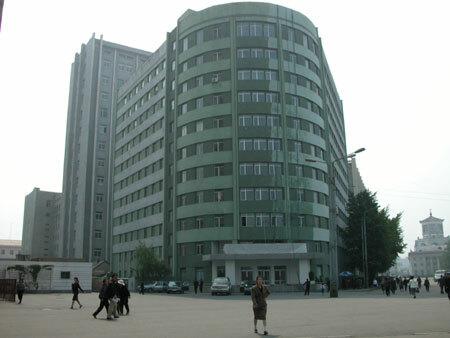 Apparently modifications to the facades of the buildings by the tenants (such as glassing in the balconies, or hanging air conditioners) are forbidden in Pyongyang, so the buildings look neat. However in other cities such creativity is abundant. I was trying to estimate the number of rooms in apartments by the number of balconies, but the girls have told me that one apartment can have more than one balcony. When you walk down the street, you have a strong feeling of being an alien. This street is quite nice, i.e. it is above average (this is easy to determine by the frames of apartment and store windows). It is somewhat like out Malaya Morskaya, but cleaner. In general, street cleaning is taken very seriously here. I will say a couple words about the bicycles. 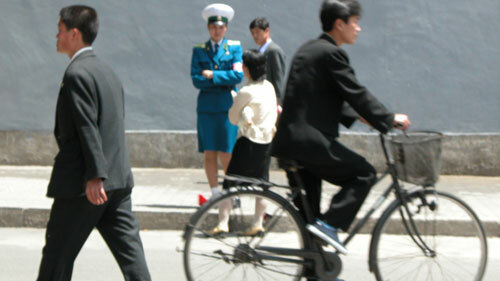 The bicycles here are used for transportation much more than for recreation. And a quite expansive means of transportation at that. 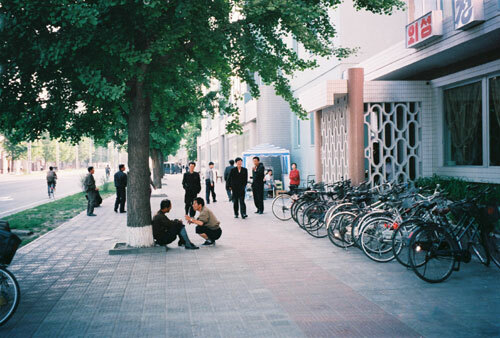 A "cheap" Chinese bicycle costs about 70 euros. Practically (considering the local salaries) it's like buying a new Lada for us. Most of the bicycles are simple ones, without gears. Every bicycle has two licence plates. As I heard, one has to take an exam to get a licence. Alcohol is not abused, i.e. there is no such problem in the county. That's what the girls have told us. We have ourselves only seen one more or less drank person during our whole visit (including countryside). - When there are more than one apartment on a floor, who cleans the halls and staircase? - What if the person, whose turn it is, doesn't want to? - We will ask him. - What if they refuse? 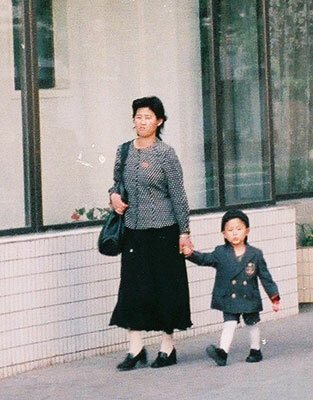 Judging by this and other similar incidents I understand that discipline is Koreans' blood. 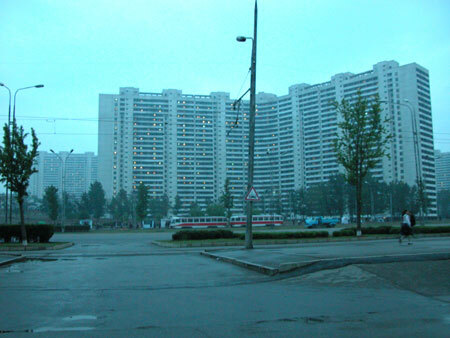 The new quarters are built here as they were built in the USSR before Perestroika. On each block, a certain percentage of the area is vegetation, grocery stores, and other infrastructure. Here is a one minute video (530 KB). It will give you a good impression of what a new quarter looks like. And another one (525KB). We have visited a local department store. Our girls did not want to take us there ("We don't usually take foreigners to local stores" :), but we insisted. As they say, there is nothing to hide. If only from the Americans and Europeans :. It was a regular large department store from the Soviet times, honest (i.e. without signs in English). As far as food, every thing is not so good (eggs, meat, and something else can only be bought with coupons), other consumer goods are easier to get. For the most part, the merchandise is imported (from China), and quite pricy. Roughly speaking, to buy a regular jacket, a simple Engineer or Interpreter will have to save money for a few months. Approximately the way it was in the Soviet Union. The saleswomen are obviously different from those in the foreign currency stores (where girls are clearly selected by age, height, and attractiveness). Though, rudeness is apparently not acceptable in Korea, regardless of the status of the store. The shoppers are common people - both workers and engineers and technical workers. They don't buy very much, mostly look and compare prices before their holiday shopping. In the musical instruments department, someone was playing a piano, put out for sale. In addition to that, some food items are sold in tents and kiosks (see a couple photos above). As far as I understand, that is private commerce. The selection is not bad there. 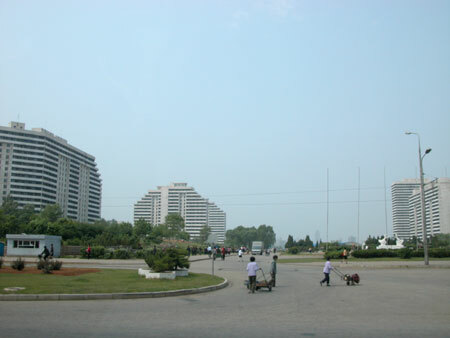 In the most common Pyongyang quarters the tendency is for comparatively modern buildings to surround little old houses and auxiliary sheds. In some places they are being demolished, in others they remain untouched, and people live/work in them. Some of them are abandoned. Unfortunately in the short one-week trip I couldn't see the dynamics of that phenomenon, so I can't make any conclusions. Blind brick fences are very common (even when they are made of wood, they are mostly blind). And that's not because of foreigners, but a common approach - same thing in villages, even the poorest ones. This interesting animal seems to inhabit only the area around our hotel. 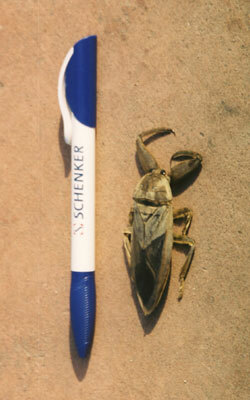 And there are large quantities of them (they probably feed on tourists). The girls called it a grasshopper, though frankly it has little in common with a grasshopper. It is quite large in size. Remarkably, this thing can fly too. While waiting for the girls, we entertained ourselves by saving those lying on their backs (they can not turn over on their own). 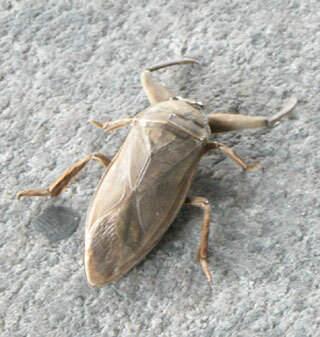 One of the readers identified this as a water bug. It really can fly, from one pond to another. 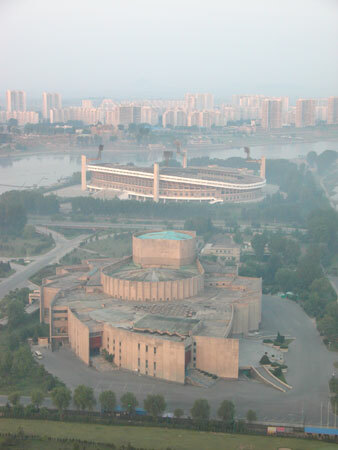 Pyongyang circus has 3500 seats. 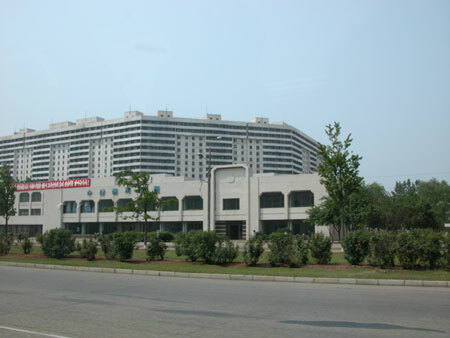 Pyongyang International Movie Theater (in the foreground, with six screens) and stadium (behind it). One thing to note about stadiums. 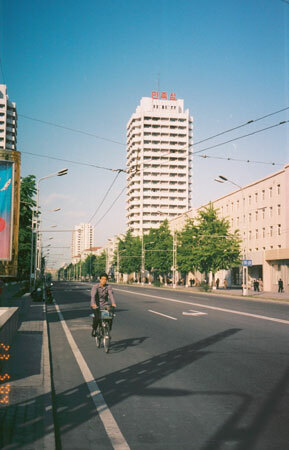 Chongun Street in Pyongyang is completely made up of stadiums and other structures built in 1988 - 1992. It is somewhat akin to a sports village. Besides, each stadium's decor implies what sport it is designed for. 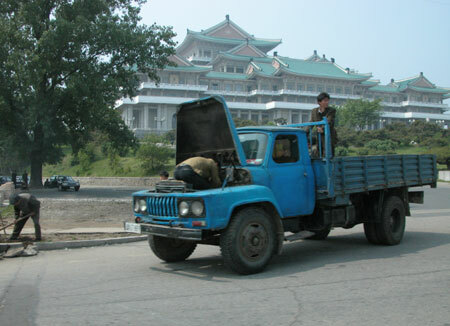 Apparently, Pyongyang applied to host the Olympic Games, and a lot of construction was done in preparation. However, obviously by the end of the 1980's a socialist country had little chances to be selected as the host of the Olympics. There was an interesting moment when Alexey had trouble falling asleep and went out of the hotel at 6 in the morning to some random neighborhood. No one stopped him.He walked for about three kilometers, and was finally stopped by a policeman, who asked him for identification (in Korean, naturally). Since, first of all he didn't have identification, and second he knew but a few words in Korean, they could not reach an understanding. A crowd gathered around them quickly (they don't meet foreigners in residential quarters very often :) and finally there was someone, who knew the word "Russian". That was what he asked Alexey, and Alexey said "yes". After that the feelings got warmer, the policeman took down his name, and let him go. There were no consequences.